When the temperature plummets, it can be hard to find something fun for everyone to do. Especially if you want to avoid the chilly temperatures while having a good time. If you haven’t tried an escape room before, though, this would be an ideal time to give it a whirl! If you’ve never been to one of these rooms, it’s like stepping into a three-dimensional puzzle straight out of a movie, and you and your team are the main characters. Whether you’re trapped in the basement of a crazed serial killer and trying to escape, or you have to solve the riddle of the pharaohs in order to get out of their sealed tomb, an escape room offers you a unique sort of challenge that you cannot get anywhere else. However, once the door has closed, the timer has begun, and you can feel the pressure start to sink in, you might realize why so many big screen protagonists start to lose their heads. You have an hour to escape the room you’re in… but if you aren’t careful, you might waste a lot of time you could be spending on unlocking doors. Because while it’s true that every escape room is different in its unique mechanics, there are some universal truths that will help you solve any room you happen to go up against. Almost every element of an escape room is selected with care, and placed as part of a greater puzzle. Sure, some things are there for ambiance, but if you’re not supposed to pay attention to something then chances are it will be screwed shut, nailed down, etc. So if you find something in the escape room that moves, or you’re given something before you’re shown in, that item probably is not random, and is worth taking a closer look at to see if it’s there for a reason. If you have a flashlight, for example, then consider turning off the lights to see if it reveals hidden text. Or if you have a bellows, look for a pipe, or other outlet that you could blow air into with it. There are definite solutions in place using the items that you have, so if you get stumped, ask yourself what elements you currently have in play, and what you could do with them. While splitting up is usually the last thing you want to do in any movie where there are traps and tension, it’s a great way to slice your time in half when it comes to getting through an escape room under the one hour limit. There are usually a bevy of puzzles and problems to solve in any escape room, and they come in a variety of styles. So the group should feel free to split up, each member trying to figure out a different puzzle until they get stumped. As you figure out puzzles, come together to see if solving one gave you the clue to unlocking another. Because some puzzles have to be done in order, but others can be done simultaneously. 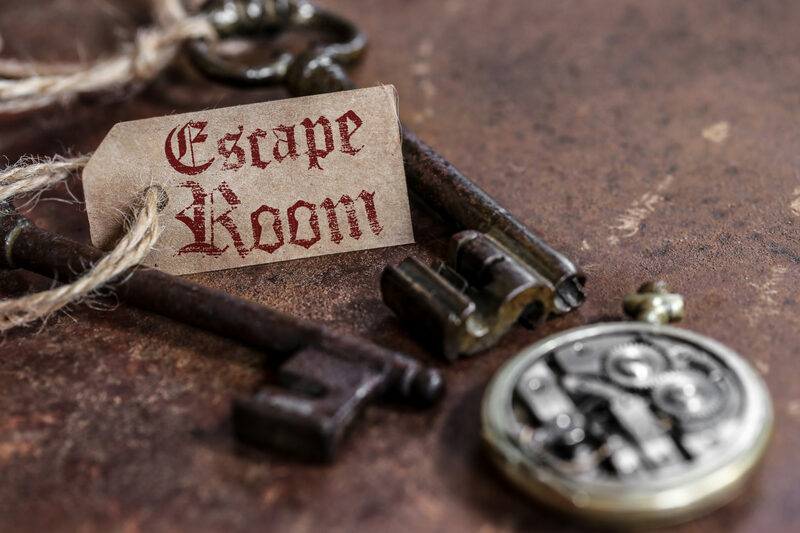 Escape rooms are a team effort, and the best thing you can do for your team is to communicate with one another. That means you need to read riddles out loud, share your thoughts with everyone else, and talk through the problems you’re facing. It might feel a little awkward until you get used to it, but it allows you to pool your thoughts and ask questions that often reveal the answers to the puzzles you’re facing. Even if you think your idea is silly, or you’re just re-stating the obvious, don’t be afraid to let it fly. Because even if your idea isn’t the right one, it might light a fire in one of your teammates that helps them figure out the answer.